LONDON — Europe's drug regulator has recommended approving the first vaccine for dengue despite concerns about the vaccine's wide use and a lawsuit in the Philippines alleging that it was linked to three deaths. The European Medicines Agency said Friday it had adopted a "positive opinion" of French pharmaceutical company Sanofi's Dengvaxia. The vaccine is the world's first against dengue, which sickens about 96 million people annually. The mosquito-spread virus is found in tropical and sub-tropical climates across Latin and South America, Asia, Africa and elsewhere. It produces a flu-like disease that can cause joint pain, nausea, vomiting and a rash. In severe cases, dengue can result in breathing problems, hemorrhaging and organ failure. Earlier this year, the World Health Organization said the vaccine needs to be dealt with "in a much safer way" and should be given mainly to people who had dengue before. The vaccine is licensed for use in about 20 countries. The U.N. health agency said there were "significant obstacles" in using the vaccine and that a rapid test should be developed to determine if people had previously been infected with dengue. Sanofi previously warned that people who had never been sickened by dengue were at risk of more serious disease after receiving the vaccine. The company said it expected to take a 100 million-euro ($118 million) loss based on that news. 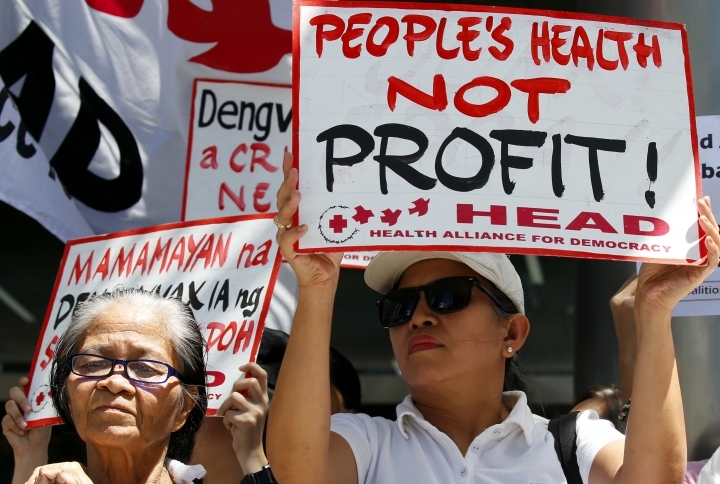 The Philippines was the first country to introduce a national dengue immunization program — which it halted after Sanofi's announcement last year. The government also demanded a refund of more than 3 billion pesos ($59 million) from Sanofi. In February, the Philippines said the vaccine was potentially linked to the deaths of three people: all of them died of dengue despite having been immunized against it.